We tend to travel with our family a few times a year. This time, before the holidays and next trip, I tried to get a head start on things that may make traveling easier. 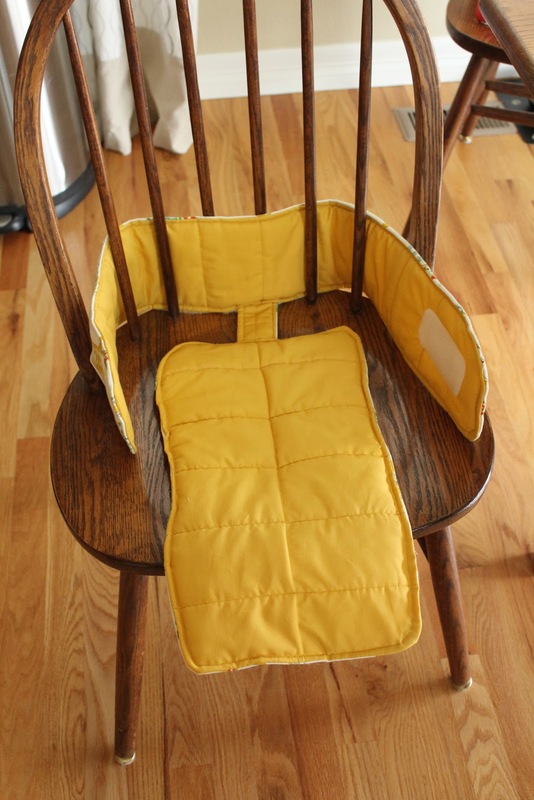 I came across this TUTORIAL for a travel high chair. In attempt to get my fabric stash down I brought out this vintage dog and cat print that I picked up at the thrift store awhile bag...there was a lot of it, so be prepared to see it again in a future post :) I also had a bit of leftover mustard fabric from a purse I made my sister over a year ago. It just happened to match perfectly. The only problem was the pattern called for quilted fabric. In an effort to use what I had, I decided to back the mustard fabric with batting and quilt it myself. Since I have no experience quilting I kept it simple. I simply drew a line down the center and then measured out 3 inch increments until I came close to the edge. I drew the lines in with chalk and sewed straight lines over them. In the next few shots you can see the error I made...I sewed the seat on the wrong side. Instead of sewing the connector piece to the short end, I accidentally attached it to the long end. This created a problem once you go to place a child in the seat. Luckily I saw the error before I traveled with the chair, removed the stitches and placed it on the correct side. It was a simple fix, but one that could have easily been avoided.